Young attaché: What are you doing? Come along . . . I came to India because of it. Vice-consul: That tune makes me want to love. I never have. A young woman sitting on a riverbank, lost in contemplation of the water carrying away to sea the flower petals she is dropping into it, as they are swept along with scraggy branches and floating debris. The summer monsoon, the stifling heat, swaths of fabric spread over the bank forming a blue checkerboard over which people move according to the laws of desire. A father who loves too much, a young man who doesn’t love enough, another who doesn’t dare to love, and the crowd that sees it all, that judges, applauds or condemns. A lakeside forest beneath the stars . . . The opening images. What is Lakmé about? If I call to mind the first time I listened to the recording that had just been made by Natalie Dessay, conducted by Michel Plasson, I remember the awe and thrill I felt listening to the choruses, Gérald’s great air and Mistress Bentson’s comical number, all in an easily understandable language. Lakmé is one of those works that have immediate appeal; many people have discovered opera thanks to Lakmé, charmed by the Bell Song and the Flower Duet and then captivated by the rest. Victims of their success, these airs often make us forget the beauty of the music, which we enjoy without taking it too seriously, perhaps because of its composer, Léo Delibes, who is better known for his ballets, including Coppélia, and his operettas. As if it weren’t possible to be cheerful and lighthearted in one work and serious in another, with the same degree of talent. The French themselves tend to be relatively indifferent to this page of their musical history, so it heartens me to see a young American conductor, Robert Tuohy, passionately seeking out all of the colours in the score, as well as the quirks and subtleties of our language. It is a love story, of course, contemporary with Carmen and more distantly related to Madama Butterfly, which, twenty years later, would bring to an end the orientalist influence in music and the other arts, for better or for worse. India doesn’t often appear in opera, even if you include Bizet’s Pearl Fishers and Massenet’s Le Roi de Lahore. Especially that particular India: one less clichéd in its folklore than might seem, despite the flowers and the pagodas; a colonial India, torn between the Hindu population and the British settlers, willing to spill blood to establish the authority of Queen Victoria in the pearl of her empire. In a literal interpretation of the libretto of Lakmé, that would be the cause of the young Indian woman’s death, because Gérald, the man she loves, has to go off to “fight the rebels,” which may be a reference to the Indian Rebellion of 1857, when the sepoys mutinied against the British East India Company. But you don’t see the war in Lakmé; rather you perceive invisible tensions, dark looks exchanged on a marketplace, unintentional jostlings – signs of the passive resistance championed by Gandhi. These are the basic elements of Lakmé: a colonial society in which two worlds attract and repel each other, capable of as much intensity and violence in desire as in rejection. Each character in the work embodies a point of view: representing the Indians, Nilakantha’s categorical and exaggerated rejection of the other; and on the British side, Mistress Bentson’s blind fascination, which is shared by Frédéric and, especially, Gérald; and the kind but rather clichéd curiosity of the two giddy young girls, Ellen and Rose. As for Lakmé, she has the most complex attitude of them all; she is the most naïve and yet the most clear-sighted. So this checkerboard of colonial society divides Hindus and Britons, the old and the young; in a way, Mistress Bentson and Nilakantha represent the parents of a boisterous brood of believers and non-believers, boys and girls. But these are not impassable Indian castes: there are holes in the fences, and parental prohibitions don’t hold much sway in the face of a desire to approach another person, to discover and to love them. 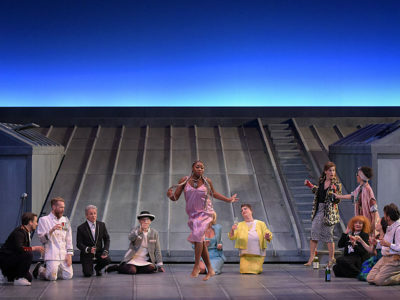 When the singers are as young as glamorous as those I am lucky to direct at the Montpellier opera house, there’s even something Mozartian in the way desire moves among them, playing tricks and getting up to mischief: three boys, four girls, numerous possibilities. Be warned, however: there’s no happy ending in the land of Durga. Here, love is not a game, and it’s not because the British are well aware of the fact that Gérald does not go to Lakmé. You may as well leap at somebody with a knife in your hand. But what is it that brings two people together who have nothing in common, who should never even have met, if not desire, which is capable of abolishing differences of language, religion, culture, social class in an instant? Yes, but for how long? This is also what Lakmé is about: an interlude, a moment of desire, the time it takes for the world to catch on and to annihilate it. I never imagined that India as one of white helmets and echoing to the sound of boots, despite the fifes of the military marches calling Gérald to his duty. Because it seems to me that there is another boundary line in Lakmé dividing the dreamers – Lakmé and Gérald – from those reminding us of the contingencies of the “real world”: in the first act, the British discuss precisely that in a lively quintet, albeit in less profound terms than those chosen by Wagner for his Tannhäuser torn between Venus the temptress and Elisabeth the voice of reason; but it’s the same theme: the difference between East and West is also the possibility of a dream, of living beyond the bounds of what is permitted. India holds up a mirror to these young Britons and their lady friends, which it is no easier to peer into than into the waters of the Ganges. Far from the banks of the Thames, nothing is the same; desires are exacerbated, melancholy looms, incomprehension reigns, sacrilege is imminent, as formidable as it is tempting. The more I listened to those Englishmen, the more I watched how they behaved, the more it seemed to me that they were men of our times: that mixture of good will and enormous tactlessness, that feeling of superiority and of guilt, of violence and gentleness, seemed to me to characterize not only the British sent to the colonies in times past but also those who are in that part of the world today, be they tourists, students, businessmen, consultants or members of NGOs protecting Bengal tigers or young girls working in weaving mills. In fact, never mind the reasons for their presence; even when they think they are prepared and arriving light years after Kipling, they still come with their received ideas and luggage too heavy to carry, and their share of blunders despite their best intentions. Although an encounter with the other is possible, it often comes at a high price, for one side or the other. Gérald and Lakmé manage to engage with each other because they have the same dream at the same moment. But, when the young Hindu sees day breaking and perceives the painful awakening ahead, she prefers to escape from it and prolong the night to infinity. She bites into a deadly flower, just as Anne-Marie Stretter of India Song disappears one night into the dark waters of the delta. In the morning, all they find is her wrap on the beach. Both are victims, victims of men and of the colonial world, but they are also victims who prefer to walk away from an inevitable end which they refuse to endure. So there are no soldiers parading in this modern-day India: the British characters appear on the banks of a river where pieces of fabric are being dyed and spread out in the sunshine to dry. A place of work, recreation and worship, the “ghats” in India are wide steps leading down to a river resembling those of a temple, where people go to sleep, eat and wash and even to die. This was the riverbank we redesigned many times with Nicolas Guéniau – who also did the costumes for the show – and that formed the set for Lakmé; a riverbank that changes through the day, becoming a mysterious enclosure, a marketplace, a square, a pagoda and, finally, a forest as dark and humid as that in Pelléas et Mélisande. But what were we to do, in our modern version, with the orientalism so dear to 19th-century audiences and that contributed to the success of Lakmé? To take it at face value would be to embrace its kitsch, while to try and counter it would be to misrepresent the work or to risk caricature (Nilakantha as the leader of a gang of fanatic terrorists jealously guarding his hijab-wearing daughter?). There was a motif I thought could represent the appeal that foreign lands continue to exercise today, in a contemporary variation: cloth. Those precious and brilliantly coloured fabrics that travellers bring back in their bags and that make Bollywood films so splendid to watch. They symbolise India’s enduring power to fascinate and, at the same time, the role played by the country in a globalised world, as the world’s textile factory, where the shirts we wear every day are produced at low cost but often at an exorbitant human price. So cloth is everywhere in this Lakmé, dyed in the river with pigments as beautiful and toxic as the poisonous daturas in Act I, suspended in the air like flying carpets in Act II, or hanging like long creepers on drying racks in Act III. The fabrics transform the riverbank through the day and night, while sentiment and desire flow in among the current of the river, whose sensual undulation has rarely been rendered so palpable by music. Lakmé is at the centre of these cross-currents, a young woman who sings her prayers to perfection and yet whose dreams lie elsewhere, torn between the love of a father who expects much too much of her and the desire of a stranger who speaks words to her that she has never heard before and that she absorbs like an exquisite poison. She wants to be the little idol that her father tried to mould to console himself for his failures, but she has not given up on life or on hoping for a different future, and that is the urge that turns out to be strongest. Out of this impossible choice, Delibes composed a melancholy that is the most characteristic and touching feature of Lakmé, a melodic theme in which happiness and despair are sometimes tinged with the same colours. She fascinates, yet intimidates those who approach her, for they know that neither their love nor their actions will be powerful enough to touch, let alone change her. Does she really die because she is abandoned by Gérald? 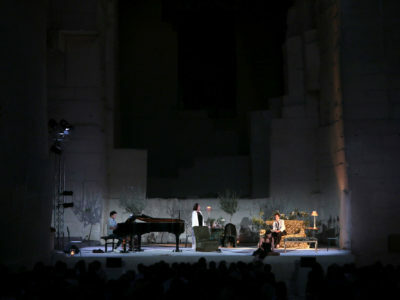 It seems unlikely, because Act III of Lakmé, with her exile in the forest and the sacred spring where lovers go to drink, is naturally reminiscent of Tristan und Isolde by Wagner (who died two months almost to the day before the premiere of Lakmé) and of the concept of Liebestod, love-death. Hindu potions may have a different taste, but in Lakmé we sense a depth, that she had already come a long way before she met Gérald, had thought about death, and longed to find peace “far from this world”. Her spiritual journey is one that she believes, for a moment, that she can pursue and share with Gérald, whom she hopes to convert to her philosophy of life. But she will end it alone, when she understands that he is incapable of following her. In this, Lakmé is akin to Anne-Marie Stretter, a classic Durassian figure whom, at the end of India Song, just before disappearing into the mists and waters of the Delta, unwittingly scares a guest who says of her: “That eternal smile is frightening”. This is the young woman I am looking for, rather than the sweet vestal virgin she is often portrayed as.